Wolves were reintroduced in Yellowstone NP in 1995 & 1996. Fear of wolves may not be discouraging elk in Yellowstone National Park from eating young aspen trees, despite research that indicated wolf reintroduction into the park in 1995 after an absence of 70 years helped restore aspen in areas where wolves could prey on elk. This is the conclusion of a study led by a U.S. Geological Survey scientist, Matthew Kauffman, suggesting that aspen are not benefitting from the so-called “ecology of fear” created by wolves. A 2007 study by Oregon State University forestry researchers found that the return of wolves to Yellowstone National Park coincided with the growth of young aspen trees in the park’s northern range for the first time in 50 years. The aspen trees were surviving the browsing of elk, OSU researchers said, which are a natural prey of wolves. 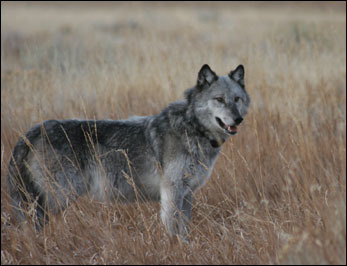 The 2007 study supported a “trophic cascade” theory of ecological interdependence — extending to plants, animals, food chains and ecological zones — observed when key predators such as wolves are removed from an ecosystem. When predators are returned, recovery from damage, in this case, to young aspen trees, was thought possible. However, the recent Kauffman-led study suggests that aspen are not benefitting from the landscape of fear created by wolves, and that claims of an ecosystem-wide recovery of aspen are premature. “This study not only confirms that elk are responsible for the decline of aspen in Yellowstone beginning in the 1890s, but also that none of the aspen groves studied after wolf restoration appear to be regenerating, even in areas risky to elk,” said Kauffman. Because the fear of wolves does not appear to be benefiting aspen, the authors conclude that if the northern range elk population does not continue to decline – their numbers are now 40% of what they were before wolves were reintroduced — many of Yellowstone’s aspen stands are unlikely to recover. “A landscape-level aspen recovery is likely only to occur if wolves, in combination with other predators and climate factors, further reduce the elk population,” Kauffman said. Predators play an important role in ecosystems, said Kauffman, and can influence plants by altering the number of herbivores or by changing the behavior of herbivores (e.g., by deterring them from areas where predators lurk). He added, however, that considerable scientific debate exists regarding the importance of reduced herbivores and changed behavior in which predators, especially large carnivores, influence their prey. “So, given that it takes a lot of energy to avoid a predator — energy that could be used to stave off winter starvation — we wanted to find out whether the prey of active-hunting predators such as wolves demonstrated risk-induced changes in areas where they foraged for food,” said Kauffman. They used a landscape-wide risk map of elk killed by wolves over the first 10 years of wolf recovery, and also experimentally fenced young aspen suckers to compare the protection afforded to them by wolves versus that of a physical barrier that prevented elk browsing. “The results were surprising and have led us to refute several previous claims regarding interactions among wolves, elk and aspen in Yellowstone,” Kauffman said. The tree rings showed that the period when aspen failed to regenerate (1892 to 1956) lasted more than 60 years, spanning periods with and without wolves by several decades. “We concluded from this that the failure of aspen to regenerate was caused by an increase in the number of elk following the disappearance of wolves in the 1920s rather than by a rapid behavioral shift to more browsing on aspen once wolves were gone from the park,” said Kauffman. Surveys of current conditions indicated that aspen in study stands exposed to elk browsing were not growing to heights necessary to make them invulnerable to elk. The only places where suckers survived to reach a height sufficient to avoid browsing were in the fenced-in areas. In addition, aspen stands identified as risky from the predation risk map were browsed just as often as aspen growing in less risky areas. A paper about the study, Are wolves saving Yellowstone’s aspen? A landscape-level test of a behaviorally mediated trophic cascade, was published online in Ecology.